Bioengineered plastics would be more environmentally-friendly than those from fossil fuel-based chemicals. (CNN) -- A team of South Korean scientists have produced the polymers used for everyday plastics through bioengineering, rather than through the use of fossil fuel-based chemicals. It is believed that the technique may now allow for the production of environmentally-friendly plastic that is biodegradable and low in toxicity. The research focused on Polylactic Acid (PLA), a bio-based polymer which holds the key to producing plastics through natural and renewable resources. 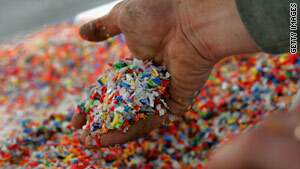 Polymers are molecules found in everyday life in the form of plastics and rubbers. "The polyesters and other polymers we use everyday are mostly derived from fossil oils made through the refinery or chemical process," Professor Sang Yup Lee, who lead the research, said in a press statement. "The idea of producing polymers from renewable biomass has attracted much attention due to the increasing concerns of environmental problems and the limited nature of fossil resources. PLA is considered a good alternative to petroleum-based plastics, as it is both biodegradable and has a low toxicity to humans." Until now PLA has been produced in a two-step fermentation and chemical process of polymerization, which is both complex and expensive. The team used a metabolically engineered strain of E. coli and developed a one-stage process. "By developing a strategy which combines metabolic engineering and enzyme engineering, we've developed an efficient bio-based one-step production process for PLA and its copolymers," said Lee. "This means that a developed E. coli strain is now capable of efficiently producing unnatural polymers, through a one-step fermentation process. "Global warming and other environmental problems are urging us to develop sustainable processes based on renewable resources. "This new strategy should be generally useful for developing other engineered organisms capable of producing various unnatural polymers by direct fermentation from renewable resources." The research team from KAIST University in Seoul and the Korean chemical company LG Chem published their findings in the journal "Biotechnology and Bioengineering".